Tired of all the over-marketed Hollywood blockbuster movies based on recycled plots following superficial characters? Then it’s time for you to visit the good old Riff Raff. This place has been one of Zurich’s main hubs for independent, non-mainstream cinema since its opening in 1998 and is a favorite among film enthusiasts. Showing anything from moderately known Sundance nominees to completely unknown productions by obscure directors, the Riff Raff offers a superb selection of indie flicks – trust me, you’ll seldom leave the theatre disappointed. And not already knowing all the key scenes from countless trailers – like with mainstream blockbusters – really adds to the pleasure. 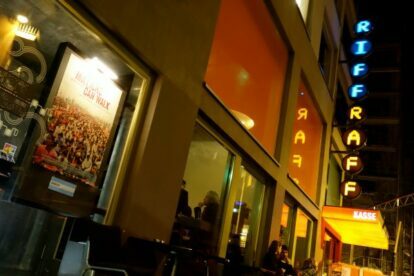 But the Riff Raff isn’t only a cinema – on the ground floor it features a stylish bar and an adjacent bistro, the latter serving quite delicious bagels and various other small snacks. Both are nice places to socialize and spend the evening, even if you’re not planning on having a movie night. But if you do spontaneously decide to see a movie, don’t forget to pre-buy your snacks and drinks since there won’t be an intermission. This is after all a place for film enthusiasts – and they don’t like their favorite pastime to be interrupted.